Of course all my work is fully guaranteed and I can treat a Hyde wasps nest problem for a set fee of £35. With other companies, who claim to be local but in fact are agencies, you may have to wait a day or so to have your Hyde wasps nest problem attended to. I can have the problem solved before most companies even reply to your enquiry. 26 years experience with all aspects of Tameside pest control and of course Hyde wasps nest and Mossley wasps nest treatment are a testimonial in themselves. If you are still unsure have a look at the domestic and commercial testimonials on this website. My response is normally within the hour and your Hyde wasps nest problem will soon be solved to your satisfaction. 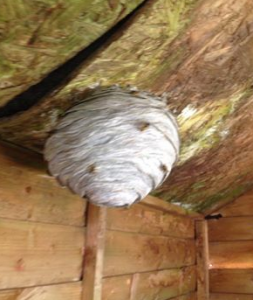 You should always employ the services of a professional with any wasps nest problem or pest control problem, attempting it yourself can have dire consequences. A wasps nest can contain up to 30,000 wasps and they can be extremely aggresive defending the nest. If you have a problem with a Hyde wasps nest or a Mossley wasps nest give me a call on 07940 062670 and I can provide a fast solution. I also provide wasps nest treatment and other pest control services in the Ashton-under-Lyne, Audenshaw, Denton, Droylsden, Dukinfield, Hyde, Longdendale, Mossley and Stalybridge areas of Tameside as well as Glossop Saddleworth, Oldham and Manchester.